You don’t want to miss the pure fun and adventure of a cruise just because of the hassle of changing your money to another currency. The easiest way to get money on a cruise is to withdraw from an ATM close to the ship that is offering a better exchange rate compared to a currency exchange office. Always alert your bank when you’re traveling. Some banks don’t charge international withdrawal fees, but most usually do. 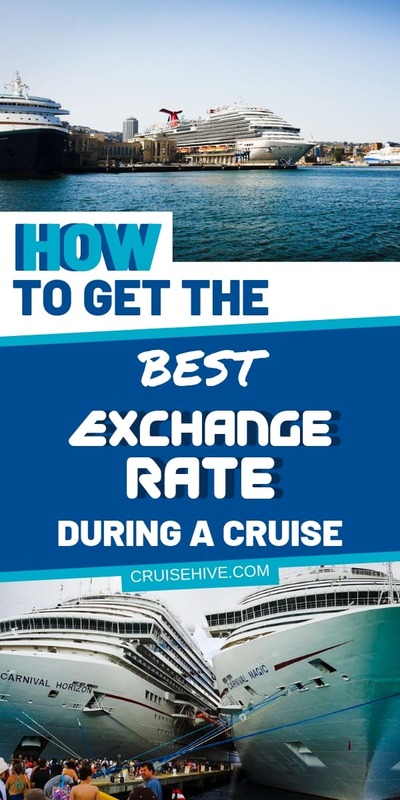 Learn more about how to get the best value for your money’s foreign exchange rate while on a cruise by continuing to read below. If you want to be stress-free while cruising, you need to have a smart plan. The first thing you have to find out is the current exchange rate through online resources, like dedicated sites or apps. By doing so, you’ll get the best exchange rate while you’re on a cruise. First, shoot an email to your bank to notify them that you’re going on a cruise to avoid getting denied when withdrawing money from an ATM or paying your bill from a restaurant. Using a currency conversion app is a good idea instead of doing the computation manually. You’ll find free downloadable currency conversion apps, like XE Currency, which is applicable for both Android and iPhone devices. Check foreign exchange websites, compare current exchange rates, and read informative blogs about getting the best rates in the places included in your itinerary. It’s a good idea to ask the cruise ship management if money changing service is available. While most cruise ships offer foreign exchange services, the funds are limited. Small bills run out quickly. Ask about the current exchange rate offered by the cruise ship. Determine if rates vary or are fixed for a specific period of time. Check for other options, like money changers on ports, since cruise ship crews are very knowledgeable about the whereabouts of foreign exchange services in your destinations. When you’re already onboard, you can ask a foreign waiter or cabin crew. These people are usually outsourced or overseas workers who also send and exchange money for family abroad. You might be surprised getting expert help you never experienced before, as they might be able to provide you the best exchange rate best practices while on board. Every country is ready for tourists, that’s why it’s not that difficult finding a foreign exchange office in a city or country that your cruise ship will have a stopover. However, it’s always best to be ready by knowing the information in advance for less hassle. Don’t waste your time scouting one money changer to another. Have fun shopping, eating, and exploring! You’ll save time and effort asking the locals about the location of the foreign exchange service. Avoid the hassle and stress of speaking or explaining yourself to locals who might not understand English or whatever language you speak. You can use the GPS locator on your smartphone for faster and easier transactions so you can enjoy your trip to the fullest. Having a cruise is indeed a splurge, but you don’t want to end up with zero savings after. It can be tempting to have your cash changed all at once when you’re in a trip, but not all foreign exchange centers have the same exchange rates. That’s why before you even think of getting your money exchanged, take one step at a time and exchange for smaller denominations first. You’ll not be overwhelmed shopping impulsively, so you can shop in all the places where the cruise stops for your utmost enjoyment. You might find a good foreign exchange office that provides a better exchange rate than the first you’ve visited. You can plan your expenses and splurge based on your budget for a worry-free trip back home. If you want to get the best exchange rate on a cruise, keep the tips mentioned above in mind. By knowing available resources, contacting the cruise ship management, checking money changers on the places you’ll visit, and knowing your spending level, you’ll have more options and can get the best exchange rate for a more empowered shopping and cruising experience.